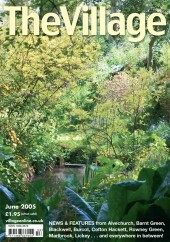 Our June 2005 cover showed the “secret” garden at Selvas Cottage in Alvechurch, which owner and poet Jenna Plewes was opening to the public as a spiritual retreat. A model of the new schools and library building in Alvechurch was unveiled, with officials behind the project pledging that the facility would be open to the whole community all year round. Meanwhile, events to mark 100 years of production at Longbridge were going ahead despite the recent collapse of MG Rover. 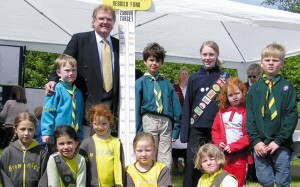 * Barnt Green Scout & Guide HQ Fund was officially launched by Sir Digby Jones, a former member of the Scout group. Local Scouts, Cubs, Beavers, Guides, Brownies and Rainbows were aiming to raise £250,000 to build a new shared HQ after the previous year’s arson attack on the old Scout hut. 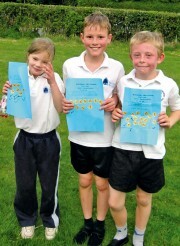 * Pupils at Blackwell First School (including Charlotte Johnson, Alex Mills and Jonathan Watson, pictured left) took part in a sponsored Mini Marathon, helping to raise around £700 for victims of the Asian tsunami.